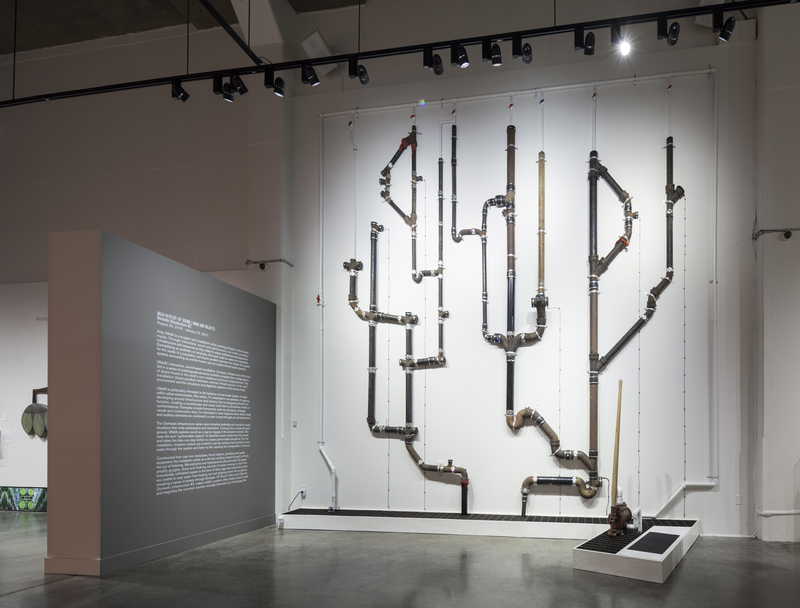 Anja Ulfeldt’s interactive, sound-based installation Domestic Infrastructure #2 is the second in a series of autobiographical sewer portraits compiled from configurations of drains found in the artist’s own residence and local neighborhood. Exemplifying an aesthetic of necessity, Ulfeldt draws parallels between external infrastructures in the built environment and the circulatory and digestive systems of the human body. The installation includes an intermittent electric pump and an antique hand pump to activate recycled running water through the system. 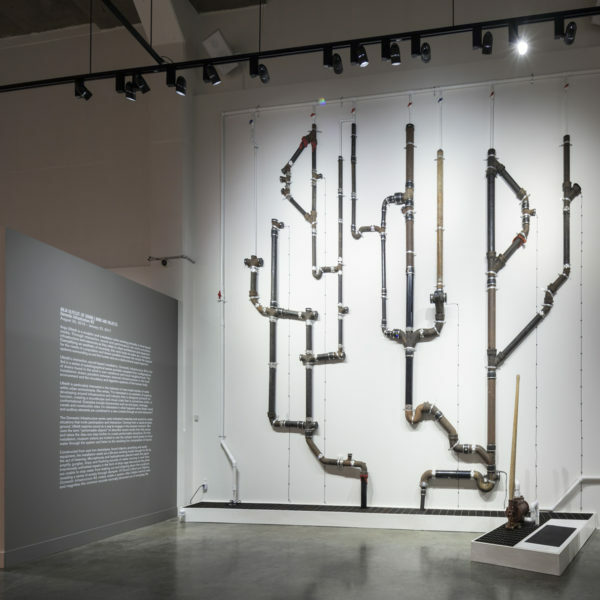 Constructed from cast iron drainpipes, found objects, plumbing, and audio equipment, the installation exists as a life-size working model brought to life by the act of listening. 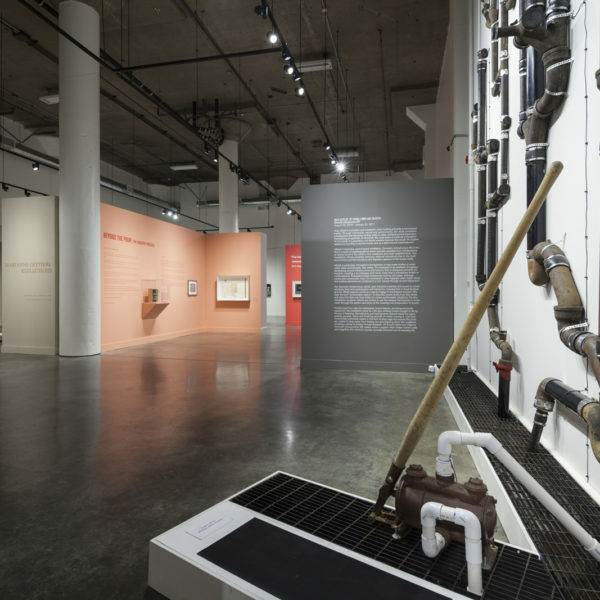 Microphones and hydrophones placed inside the pipes amplify gurgles, drips and flushing sounds of water moving in real time. Intentionally attempted repairs in the form of shop rags tied around the joints are unable to stop water from leaking out and dripping down the sculpture, revealing a sense of anxiety through disrepair. Of Sound | Mind and Objects, Domestic Infrastructure #2 makes visible a system often hidden behind walls and amplifies the common sounds normally drowned out of everyday life. 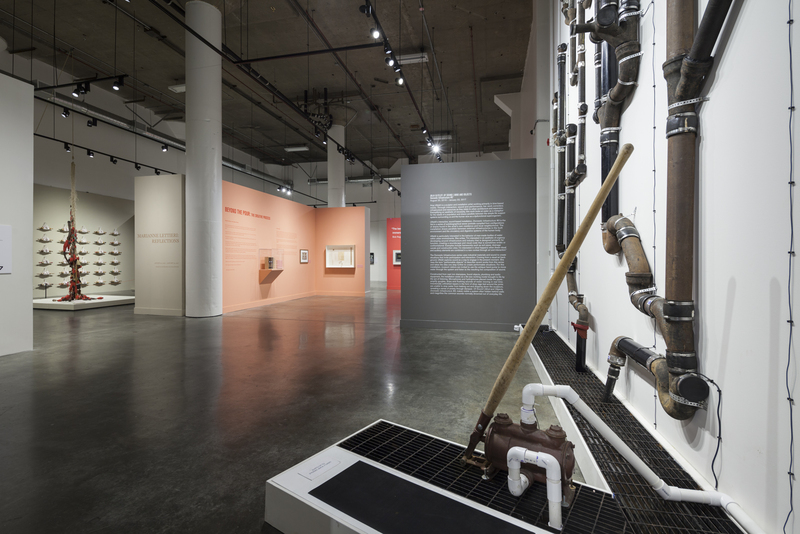 Museum visitors are invited to use the antique hand pump to move water through the system and listen to the resulting live composition of sound. Images: Anja Ulfeldt: Of Sound | Mind and Objects, install shot, image courtesy of Henrik Kam.